“Ten motherless children, the eldest a girl of fourteen, the youngest a baby of six months; the father, labourer out at work all day; the youngest children very ill (especially the baby) with pneumonia after measles, and another lately removed to the hospital with typhoid fever. “The state of the children and room is more easily imagined than described. The neighbours feared infection and would not help, and for want of guidance and encouragement the elder girls seemed to have lost heart and let things go as they would. “On the appearance of a stranger the little ones screamed, especially when the nurse began to wash them, cut and comb their hair, and make their beds. 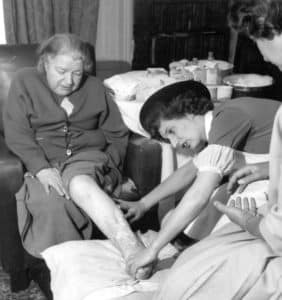 No clean clothing was to be found and some was provided … Poultices were applied and food prepared. Nurse told the elder girls how to clean up the house and by her third visit a transformation had taken place. A death certificate from Wallasey in 1919 records the death of Isabella, aged 45, from pulmonary tuberculosis and “exhaustion”. She too had had ten young children and her husband was a labourer. Isabella was the grandmother of Chris Holme, who provided QNIS with valuable assistance in researching and drafting these history pages. She died just six months after giving birth to his dad. Every family has a similar story in their past. The First World War saw many Queen’s Nurses join up for service at home or service overseas. Among those who didn’t come back were Louisa Jordan, who died of typhus in 1915 serving with the Scottish Women’s Hospitals in Serbia and Jessie Jane Paterson who died from dysentery in 1916. Windows were shattered at Castle Terrace during a Zeppelin raid in 1916. That year, a rule was also introduced banning the enrolment of aliens as Queen’s Nurses. Some were already in post: Kirriemuir’s long serving German-born nurse was the subject of abuse by some locals. Nurse Roeher working in Langholm asked for her leaving certificate in case she was forced to repatriate. The legacy of war created some Queen’s Nurse posts. 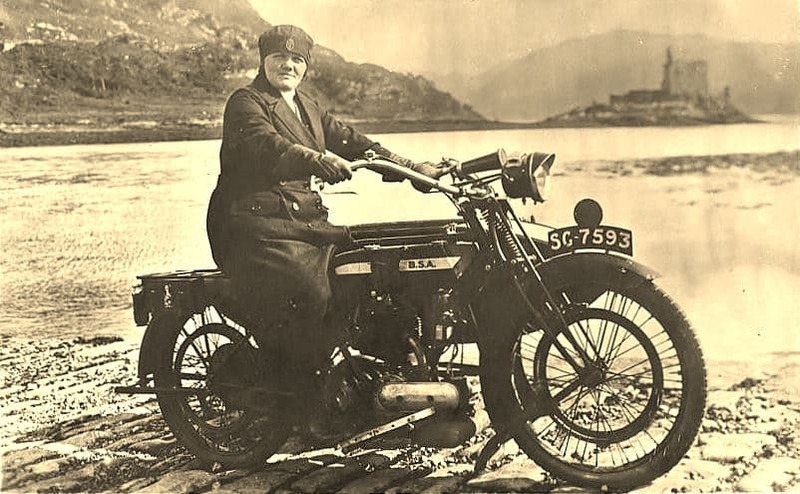 The photo at the top of the post is of Elizabeth McPhee in 1926 astride her BSA motorcycle on the ferry slipway at Dornie, Inverness-shire, with Eilean Donan Castle in the background. 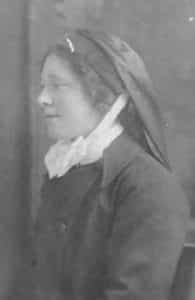 The Clan Macrae Society funded various memorials after the First World War but also a district nurse post in the parishes of Kintail and Glenshiel as “this was considered a better form of memorial to the gallant clansmen who had fallen than by wasting money on bricks and mortar.” Elizabeth later nursed at Airth near Stirling.